This is not a new idea. Onions were used by certain individuals in Europe to successfully fight off the plague in the early 1900’s. Ayurvedic medicine has been using an onion poultice for the chest or feet to cure coughs, fevers and flus for centuries. They also use the onion poultice to reduce pain and inflammation in the joints. Homeopathic doctors also use the healing power of onions to heal from viruses and illness. I even know people in the North American Hutterite community, a pacifist community similar to the Amish whose traditions date back to the 16th century, who tell me it is common practice to place onions in their homes during winter flu season and to use cut onions in the room of an ill person to relieve their symptoms quickly and naturally. It is said that white onions work better than red onions. Yellow onions would be an acceptable alternative, but white onions, with the latin name Allium Cepa, work best. 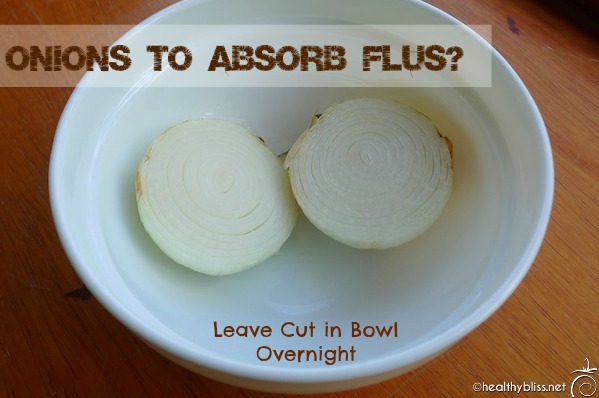 The onions need to be peeled if left around the home as a preventive measure against flu and viruses. Many people do this during flu season and find that no one gets sick, whereas in previous years with no onions, they had several members of the family fall ill. If placed around the home for prevention, the onions should be replaced every 3 months. If someone falls ill with a cough, flu, cold or fever, immediately place a peeled white onion cut in half in a bowl in their room. The onion needs to be cut in half in order to expose the most amount of ‘healing power’ from its pungent odor. Cut onions can also be used to eliminate mold smells in a closet, drawer or room. It’s best not to leave a cut onion open in the fridge (to eat later) because as soon as an onion is cut, it will start to absorb bacteria, etc. So, if you cut an onion for a salad, either use the whole thing or put the other half in your garage or basement to absorb bad smells! Once the onion is in a salad in a sealed container, it is safe and can be eaten at a later time. The Mighty Healing Power of Onions! Onions are rich in sulfur-containing compounds that are responsible for their strong odor. Sulfur is a powerful detox element and helps the body to release toxins, especially for the liver. Foods naturally high in sulfur also help the body to detox from heavy metals like lead, arsenic and cadmium. The onion is the richest dietary source of quercitin, a powerful antioxidant flavonoid that has been shown to thin the blood, lower cholesterol, ward off blood clots, and fight asthma, chronic bronchitis, hay fever, diabetes, atherosclerosis and infections and is even linked to inhibiting certain types of cancer. Onions are also naturally anti-inflammatory, antibiotic and antiviral. That, of course, is when you eat them! Fast-forward to me being in Vilcabamba, Ecuador where I’m here renting a house for 2 months to do an extended water fast. In the first few days in the house, we noticed a very bad septic smell coming from both toilets which never got better, no matter how many times we flushed or cleaned the toilets. 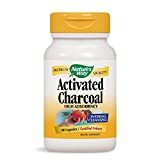 After we started the water fast and became more sensitive to smell, I thought to myself, What can we do which is completely natural and will still take this smell away? Then I remembered everything I read about the Almighty Onion! That night, we sliced 2 white onions in half, placed 1 onion in each of 2 bowls and put one bowl in each bathroom overnight. The onion smell at first was very strong, but that is actually a great smell when you are water fasting (we dreamed of tomato gazpacho with onions!). The next morning, to our complete amazement, there was no more onion smell, and guess what? There was no more septic smell either!!! I became so excited with this discovery that I wanted to try to Onion Sock theory. Luckily, we still had 1 onion left in the house, so the very next night, we cut the onion into 4 lateral thick slices (each slice about 1/2″ thick). I use 2 slices on my my feet and gave the remaining 2 to my boyfriend who willing put them on his feet. 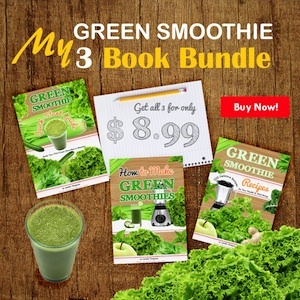 (Yes, he is a willing participant in all of this stuff including the water fast because, one, he is very open to try new things and he trusts my skills and experience, and two, because he lost his mom to cancer 8 years ago and knows that clean diet, clean body and clean mind are the keys to good health). Now, the interesting part of this story is that we were on Day 5 of a water fast when we tried the Onion Socks. Mainly, I wanted to see if the onion could be used as a tool to amplify the detox effects. Especially with the body being so clean, the fumes from the onion could theoretically be absorbed through the skin and pass through the body more quickly, and perhaps eliminate internal bad bacteria or even parasites. With Onion Socks on, we waited anxiously to see what would happen. Note that both of us were feeling good all day and I felt great when we placed the onions on our feet. My boyfriend was feeling pretty tired and weak after his evening enema but had felt really good earlier in the day. After about 30 minutes with the Onion Socks on, I started to feel distinct quivers in my calves and a twitch on my left side at the rib cage. 20 minutes later, I started feeling heartburn! That was amazing. I have not had any acid reflux at all during this water fast (although is was an issue during my last water fast, all of which I explain in my ebook: Water Fasting Guide & 40-Day Journal). Shortly after that, I started to feel hot in the head. In another 10 minutes, my eyes started to tear as if I had just cut an onion, although a much milder sensation but clearly a distinct tearing. 5 minutes after that, my boyfriend told me he had the taste of onion in his mouth! So clearly, something was happening, even if it was only onion fumes passing through our bodies and nothing else. The next morning, we compared notes about how we felt. My boyfriend had a terrible night and barely slept and felt that the onion fumes had upset his intestinal worms (which we are sure he has and are hoping the water fast will eliminate). I felt tired and weak, the first day for me to feel that way, but I did feel better. I don’t think it was the placebo effect as I am very open to trying something and saying it doesn’t work. And the real reason why I think it worked is because 90% of my hay fever and allergy symptoms disappeared overnight!! That is the best part of this story so far. Ever since we arrived to Vilcabama, I have been sneezing like crazy, scratching my nose all the time with excessive mucous coming out of my nose almost constantly. Well, they say that raw foodists don’t have allergies so I could not understand what was going on and I was hoping that the water fast would help. But, we went through Day 1-4 with absolutely no change and no relief, still sneezing up to 50 times a day easily. Well, after the Onion Socks, I did not have any mucous, and I went through the whole day with no itchy eyes and no itchy nose and I think I sneezed only 2 times the entire day!! Now, that is no placebo effect! Anyone who suffers from allergies can appreciate how wonderful the sense of relief is, and to find a natural ‘cure’ and experience allergy relief from 1/2 of an onion?! Wow!! Today we went out and bought 10 more onions and we are going to continue with the Onion Socks intermittently during our water fast. I’ll update later with more results. Meanwhile, consider trying this yourself at home. I mean, what do you have to lose except for the cost of a few onions? In my opinion, it’s a safe and effective method with nothing to lose and a lot to possibly gain. UPDATE: I did the Onion Sock again the next night, and that was it. One month later, eating again, and all sign of hayfever are still gone! I recommended this to a Natural Hygiene Raw Foodist in Vilcabamba who was also having hay fever allergies, and he had noticeable reduction of symptoms after 24 hours. This article is not meant to diagnose any disease. For any serious medical concerns, always consult with your doctor. 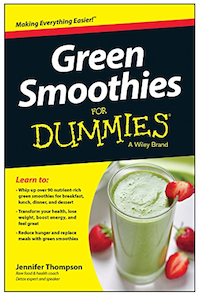 How to Eat Clean: Start with Green Smoothies! 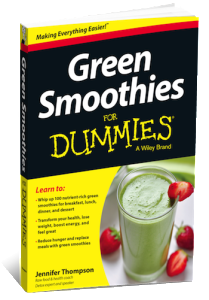 Check out my book Green Smoothies for Dummies – I’ve got loads of recipes using dark leafy greens and many delicious combos without any chemical additives, flavorings or refined sugar. It’s so easy! When you take care of your whole body, you get whole body health. When you let your food be your medicine, you are always moving towards better health. Detox Reaction vs. Allergic Reaction or Intolerance – Which one is it? https://healthybliss.net/bliss/wp-content/uploads/2013/05/onionNEW.jpg 403 600 Jennifer Betesh https://healthybliss.net/bliss/wp-content/uploads/2014/11/hb_logo_01.png Jennifer Betesh2013-05-06 13:25:052018-06-29 07:55:43Healing Power of Onions: Can Onions absorb Bacteria, Viruses and Flu?